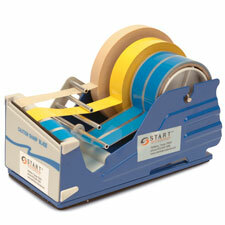 SL7346, 4" Wide Manual Multi Roll Tape Dispenser: Ability to dispense FOUR 1" (25.4mm) rolls of tape. By START International. The START International SL7346 4" (102mm) Wide Multi-Roll Manual Tape Dispenser can dispense four 1" (25.4mm) wide tapes (or any other configuration of tape widths up to a maximum of 3" wide). Tiered metal bars help guide and separate the tape rolls for optimal use. 3" (76mm) tape cores included.